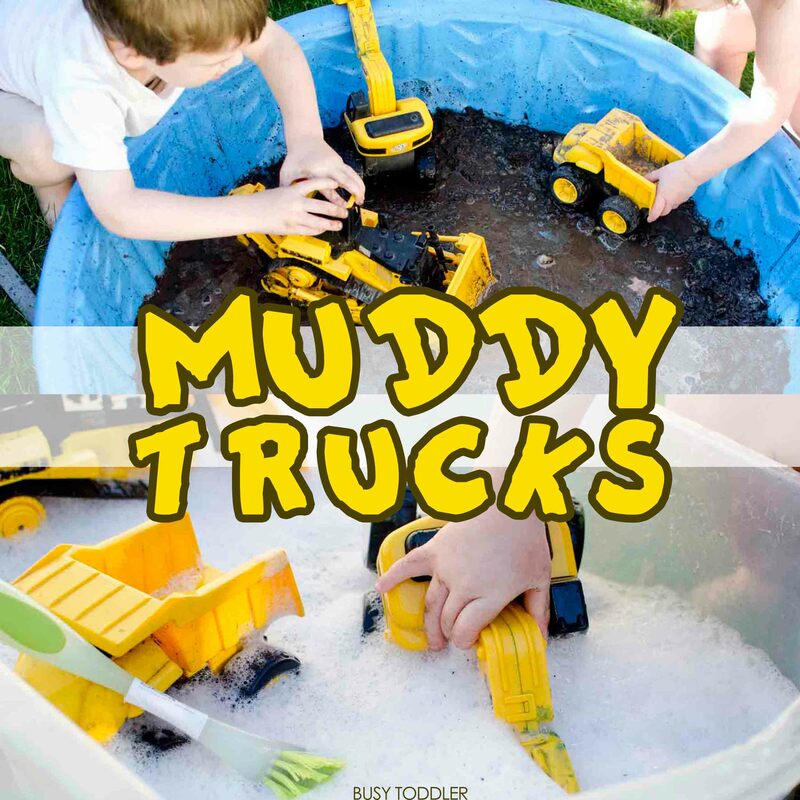 Have some messy fun with Muddy Trucks! Sometimes you just have to let those kids get a little messy. 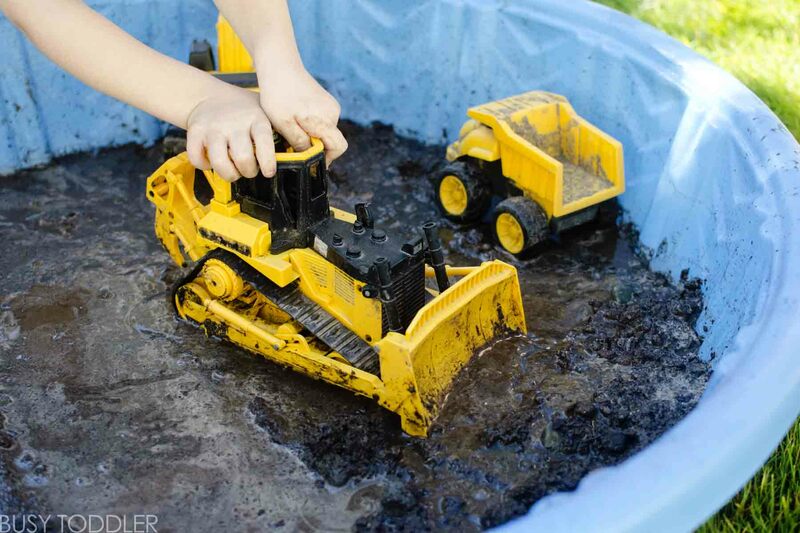 And nothing is better than outdoor summer time messy when you can keep those toddlers contained (and away from furniture) with a hose just inches away! 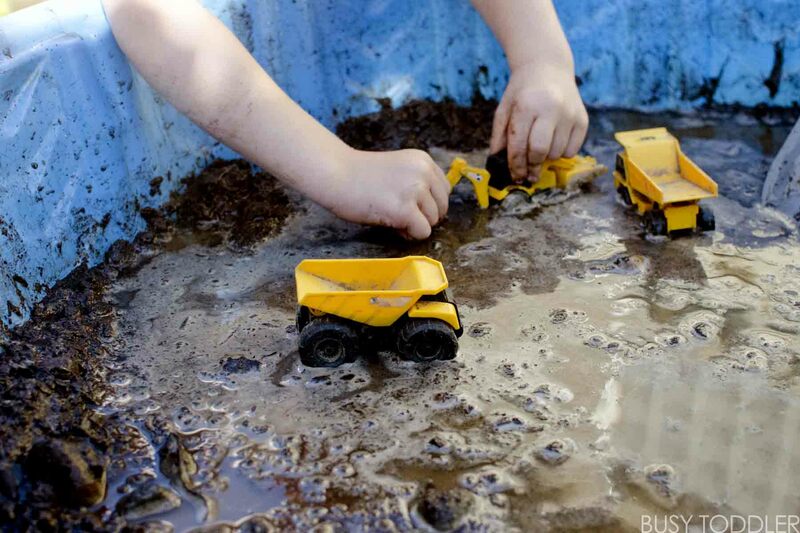 Have a little fun with your messy play with this muddy trucks activity. Messy activities can be a little scary for parents – so much to clean (except they really aren’t!) 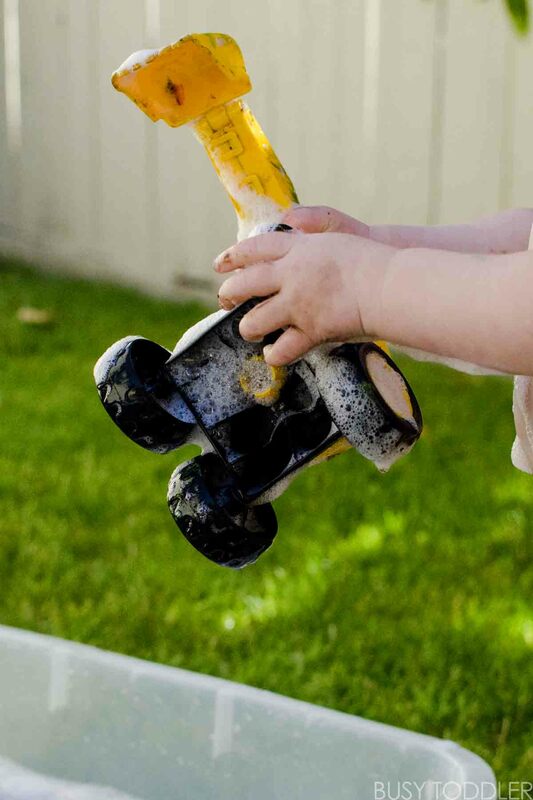 Outside messy fun in the summer is the perfect place to start learning how fun and easy messy play can be. Setting up muddy trucks is so easy! This took me just a hot second to set up for my kids – and they played for nearly 30 minutes with this set up. Well worth the 4 minute time investment! I scooped a bunch of dirt into our kiddie pool, added water, and VIOLA! Mud was made! I dumped in a few trucks and let the dirty party begin. What about the mess from muddy trucks? Of course my toddlers (3 years old and 18 months old) got filthy playing this activity. But I didn’t mind: the hose, the sprinkler, etc were all just feet away to start the clean up process. It’s a manageable mess. I promise you messy fun like this outside is so great for toddlers and so fun to watch. 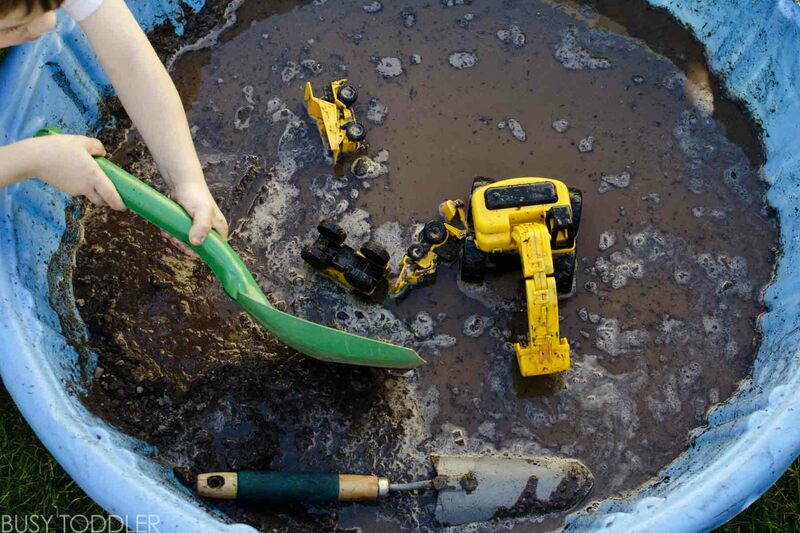 My toddlers had such a great time playing in this mud pit! Mud is scarce in the summer so having our own special mud was just right and such a treat. 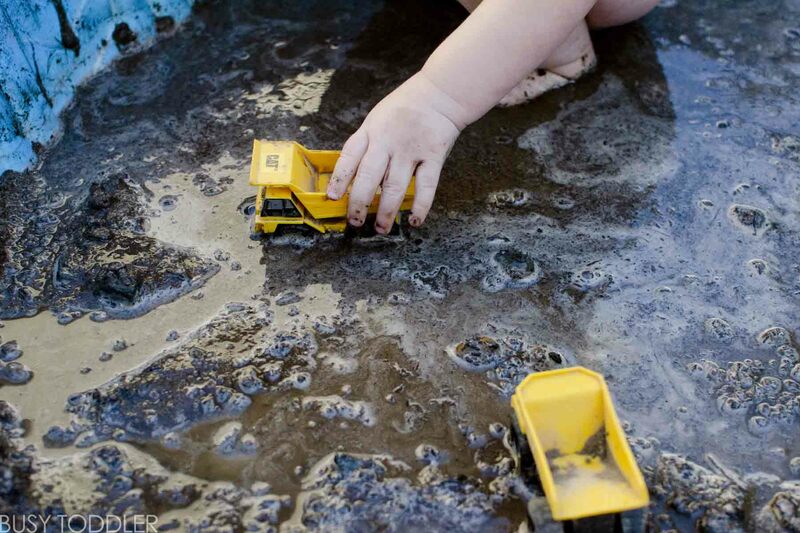 They made a whole little muddy world for themselves and their trucks in this play space. And, those two decided I hadn’t added enough dirt and went shoveling for their own. How fun is that? 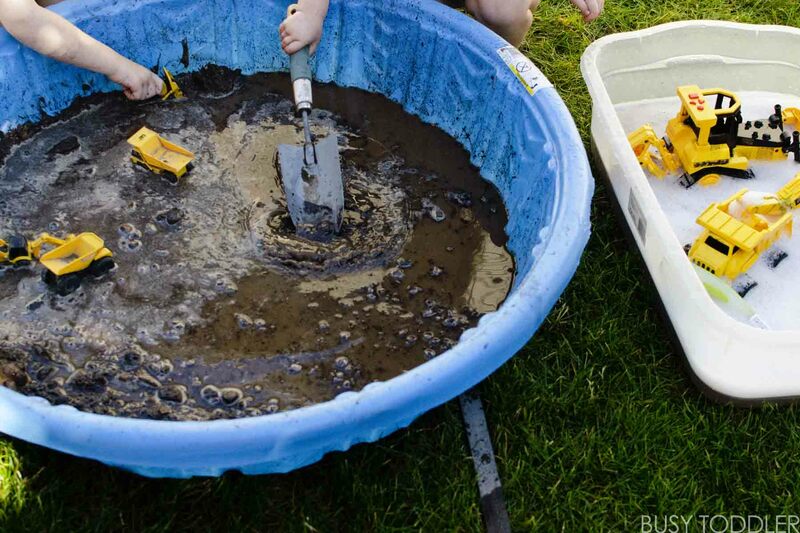 They brought scoops and scoops of dry dirt into this kiddie pool and made their own mud. Knowing how muddy their trucks would get (even though these are dedicated “outdoor trucks”), I filled up a storage container with tear free body wash and hose water for them to wash their trucks. Both kids loved this part of the muddy play: getting the trucks clean. Trucks were going from clean to muddy, muddy to clean the entire time they played! It’s such fun to me whenever activities can have multiple steps or stages to them. 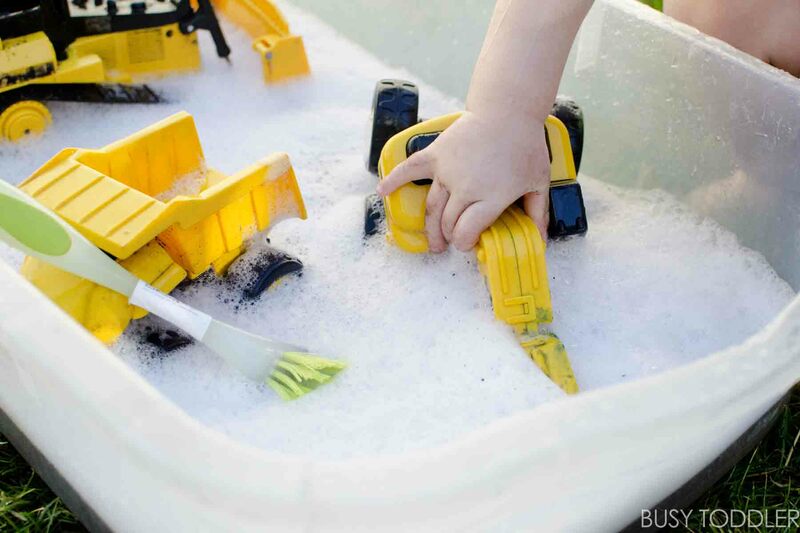 In the end, both my kids were lightly hosed off outside – just to get them “clean enough” to be carried inside the house for a must-do bath (basically step 3 of this activity!). All told with mud, car wash, and kid bath, this bought me almost an hour of activity time. Oh and later that day, I hosed out the kiddie pool and all was back to normal. Muddy trucks was the perfect way to spend a summer morning with my toddlers. We had so much fun getting dirty and make a mess of things. Thank heavens for bath tubs and bubbles to get everything clean! 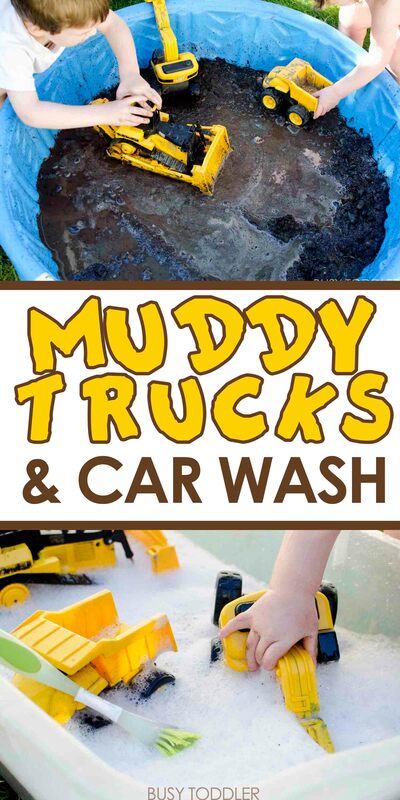 Will you try muddy trucks with your kids?